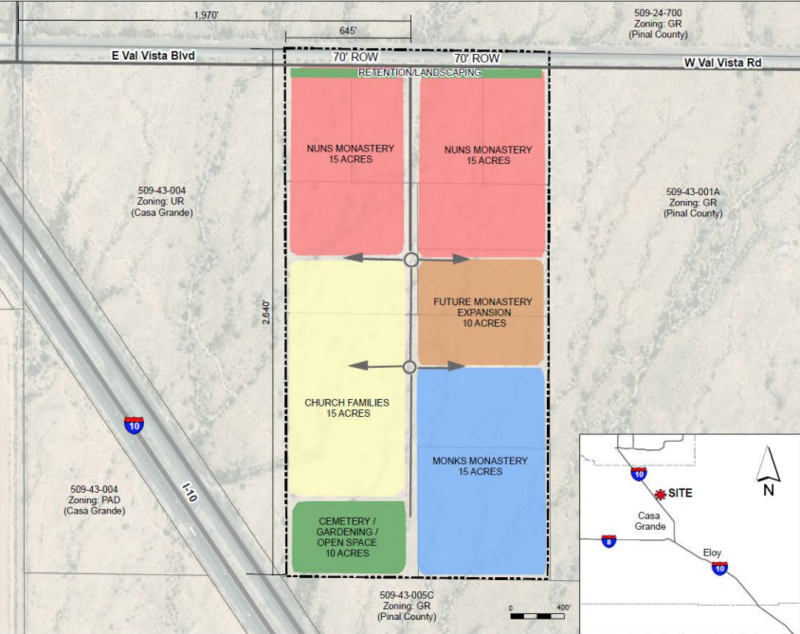 The Planning Center has submitted a proposal to the City of Casa Grande for the St. John the Baptist Orthodox Brotherhood and Holy Virgin Mary & St. Macarius Orthodox Sisterhood requesting a Conditional Use Permit to build a monastery facility with other associated uses on 80 gross acres along East Val Vista Boulevard east of I-10. The order wants to develop Holy Theotokos — two multi-phase monasteries on the currently vacant site. When completed, the associated uses would include “multiple chapels and sanctuaries, community centers, and residences for monks, nuns and families who work within and utilize the monasteries,” the submittal states. The development goals for Holy Theotokos are divided into four conceptual phases. In the first phase is envisioned to include the central collector road and infrastructure, a 2.5-acre site for both the monk and nun sections and five acres for the family section. These will probably include “chapels, living quarters for the monks, nuns and church families, a church library and office, retreat area with landscaping and a fountain, and associated parking.” It also includes a cemetery, open space and amenities, such as garden and agricultural areas. Phase Two would expand the earlier sections and include a visitor/community center, new quarters and grounds areas. The previous residential areas would transition to other, more visitor-friendly uses. Phase Three would continue expansion of the monastic facilities to full build-out, and Phase Four features a yet to be planned expansion area to tie the facility together. The staff report filed in preparation for the Nov. 1 Casa Grande Planning and Zoning Commission meeting to discuss the proposal notes the location is currently zoned B-2. B-2 zoning allows for “church uses” if a Conditional Use Permit is issued. The report explains church uses also have the potential to include accessory uses and structures — living quarters, cemeteries and gardens, among others — in support of the primary function. The staff recommended approval, stipulating a condition that major site plans comply with the conditional use plan already submitted, and that submittal and approval of major site plans for each phase of the development be required.